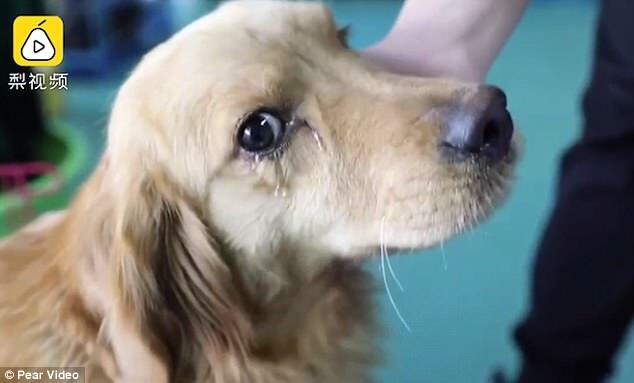 This is the extraordinary moment a dog apparently started tearing up after being rescued from the dinner plate by a group of animal lovers. 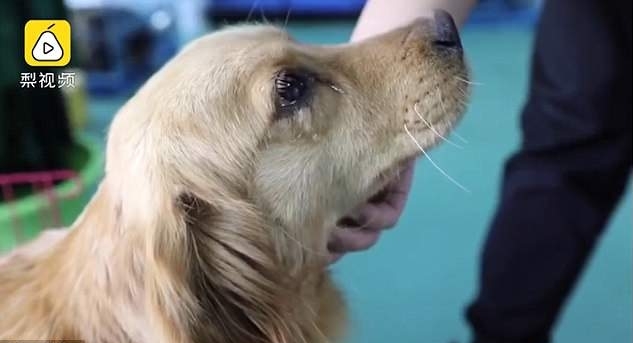 The female golden retriever, believed to be a stolen pet, had been spotted being sold by a vendor at a Chinese market known for its dog meat trade. Animal lovers raised money to pay the dog meat vendor on the spot. One of the animal lovers, known by her surname Xu, told MailOnline that the group comprised dozens of people. They raised 14,450 yuan (£1,612) to buy the golden retriever as well as around 20 other dogs from the vendor. The incident took place on April 1 at Kunming's Xiaobanqiao Market. All of the pooches are thought to be stolen pets and were locked up in rusty cages when the group saw them. The group of animal lovers are volunteers for Kunming's Sanhe Animal Protection Centre. They had gone to the market to look for a missing pet before seeing those caged dogs. One of them looked like the dog they had been looking for. Apparently, the vendor told them that those pooches were 'meal dogs', which means they were there to be sold to restaurants to make dishes. The vendor charged 60 yuan (£6.6) per kilogram. The group decided to buy all of the dogs on the truck from the vendor, and all of them started donating money. After paying the vendor, the group took the dogs to Kunming's Dongfang Animal Hospital for medical examination. Responses to "Dog 'cries tears of gratitude' after being saved from meat trade in China"